I chose such dress so Andrusha can fall in love with me again. And in the evening, guests come up to me and said that I’m beautiful. 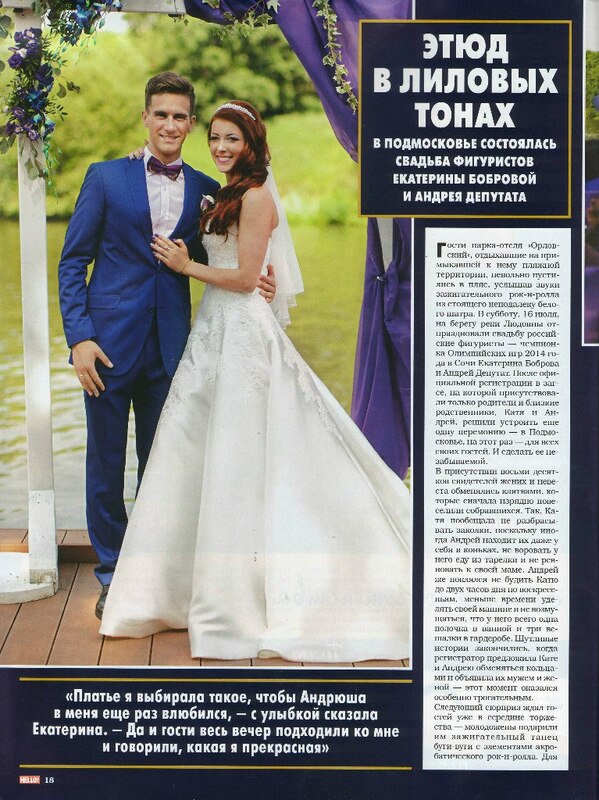 Saturday, July 16 Russian figure skaters Ekaterina Bobrova and Andrei Deputat celebrated a wedding on the banks of the river. After the official registration of the marriage, which was attended only by close relatives and parents, Katia and Andrei decided to make another ceremony in Podmoskovie – for all their guests. And to make it unforgetable. Ekaterina organized her wedding by herself. So, everything turned out exactly how newlyweds wanted: romance, guests, flowers, music and favorite Katia’s favorite color – all wedding details were in purple shades. In the presence of eighty guests bride and groom exchanged their vows that pretty amused the audience. Katia promised not to scatter her pins, because sometimes Andrei finds them even in his skates, not to steal food from his plate and not be jealous of her mother. Andrei vowed not to wake up Katia till two o’clock in the afternoon on Sundays, to devote less time to his car and not resent that he has only one shelf in the bathroom and three hangers in the wardrobe. Humorous stories ended when the registrar proposed to exchange rings and declared Katia and Andrei as husband and wife. This moment was especially heartwarming. The next surprise was waiting for the guests in the middle of the celebration – Katia and Andrei presented a fiery boogie dance with elements of acrobatic rock-n-roll. For this dance bride and groom dressed in the style of the 1960s. They have been preparing this dance for several months. And in the end everyone was pleased with the snow-white wedding cake, on which with the help of 3D projection Katia and Andrei transferred their photos. At the end guests decorated the cake with sweet decor – turned out tasty and unusual. As it turned out wedding doesn’t exempt athletes from work. In a two-week honeymoon they went in advance, and the day after the wedding has returned to the ice – to prepare for the new season. These two sound like a funny cute couple. Congrats!